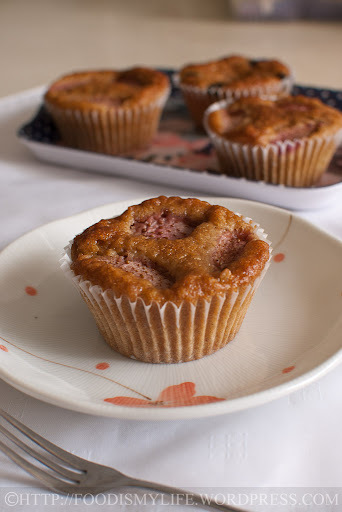 The Bake-Along this week is supposed to be a Strawberry White Chocolate Chip Cake by Cake Keeper Cakes… but I made several changes and it turned out to be a totally different cake – a Strawberry Oatmeal Brown Sugar Cupcake – but they still tasted pretty not bad (thankfully)! There were several ideas I had in mind when I baked this cake, the first to make this a no-mixer-is-needed-cake, so I swapped out the butter with olive oil – so all I needed were just a whisk and two bowls! Overall it’s an extremely easy cake to put together and it is very soft. The baking soda reacts with the buttermilk and together with the baking powder, creates a beautiful rise in the cake. And the good thing is, it requires the use of an egg yolk, which helps to clear the stash of egg yolks I have from all the macaoron baking. It’s a very light and not-so-sweet cake, perfect for breakfast and tea! Onto the step-by-step photos and recipe! 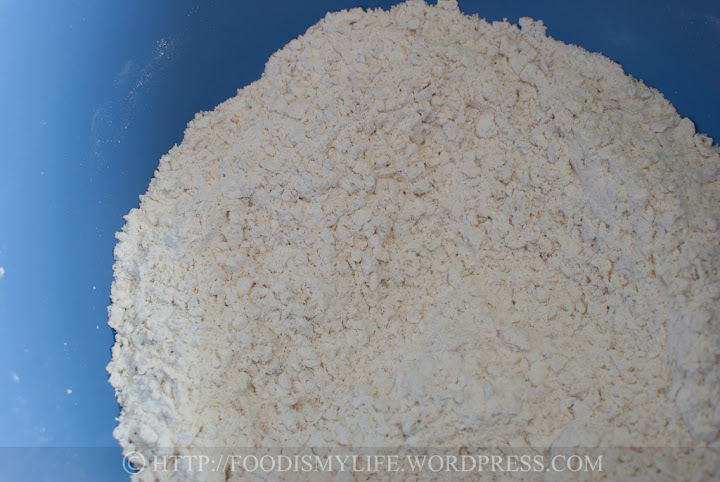 Combine the flour, oats, baking powder, baking soda and salt in a bowl. Whisk to mix them all up. 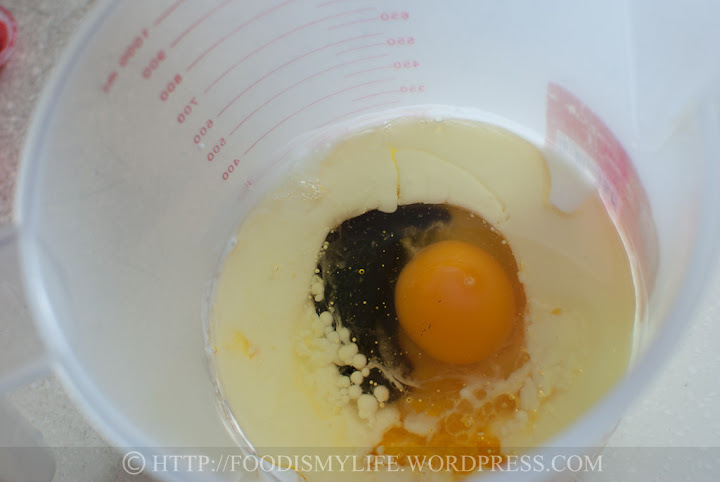 Egg, egg yolk, buttermilk, vanilla, olive oil in a measuring cup. Whisk to incorporate them together. Whisk it into the dry ingredients. How about some blueberries for a change? 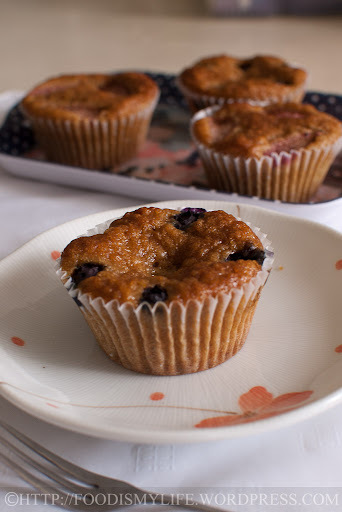 Easy-peasy and delicious for breakfast! 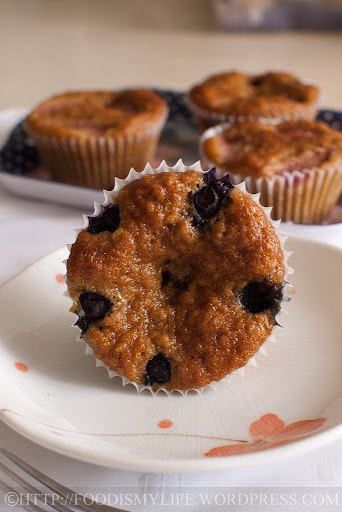 The blueberries version – warm it up in a toaster and it’s delicious! I’m submitting this to Bake-Along (27 Mar 2012) hosted by Joyce from Kitchen Flavours, Lena from Frozen Wings and Zoe from Bake for Happy Kids. Do drop by (click the froggy picture below!) to see their and other bloggers lovely bakes! We are making crème brûlée for the next Bake-Along (10 Apr 2012) – am really excited because I’ve never tried it before (another item to strike off my will-bake-this-one-day-list). 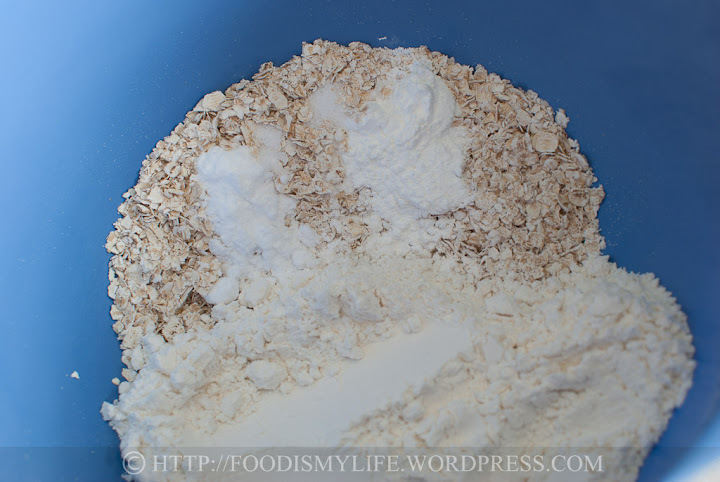 Measure the plain flour, instant oats, baking powder, baking soda and salt in a medium bowl. 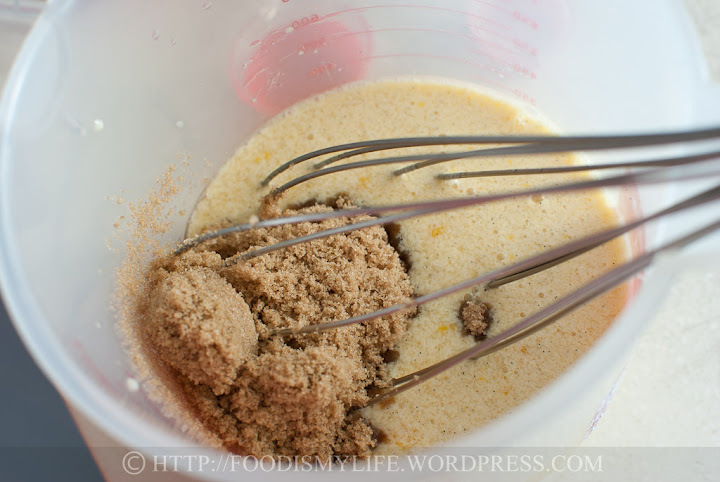 Whisk with a wire whisk to mix them altogether and to get rid of any huge lumps. In a separate bowl or measuring cup, combine the egg, egg yolk, sour cream (or buttermilk), lemon zest (if using), vanilla extract, olive oil (or vegetable oil or melted unsalted butter). Whisk with a wire whisk to mix them altogether. 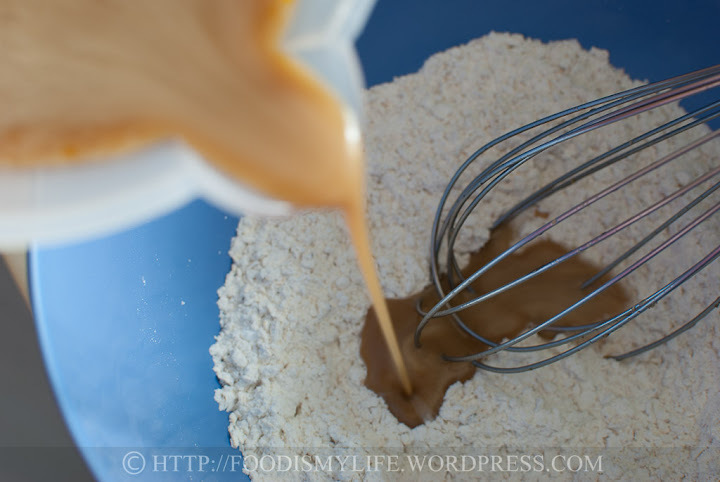 Add in the brown sugar and whisk until the sugar has dissolved (not all will dissolve but that's alright). 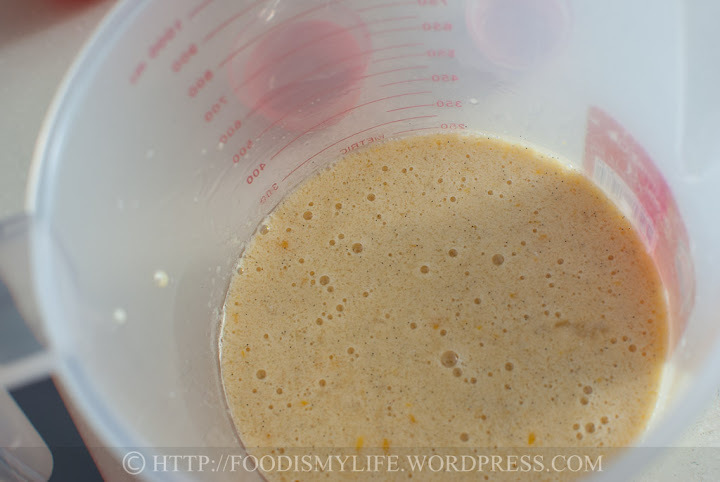 Pour the liquid mixture directly into the centre of the dry mixture and whisk together gently until all the dry mixture has been fully incorporated. 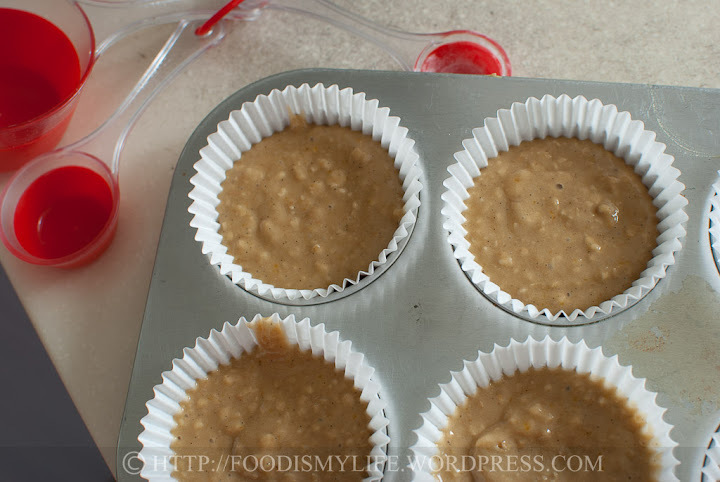 Spoon the batter into the cupcake cups until half-full, top with 3 strawberry quarters - make sure the batter does not exceed ⅔ of the cupcake liner, otherwise it will overflow. Bake for 15 to 20 minutes until a toothpick inserted into the centre of the cake comes out clean. Let the cupcakes cool in the tin for 2-3 minutes then remove them to cool completely on a wire rack (so that condensation doesn't occur on the bottom of the cupcakes). You can also use rolled oats if you have that on hand. Don’t use oat flour because it will cause the baked goods to be very dry. Thank you for the compliments and thanks for dropping by. Take care! Thank you Leslie! Take care! 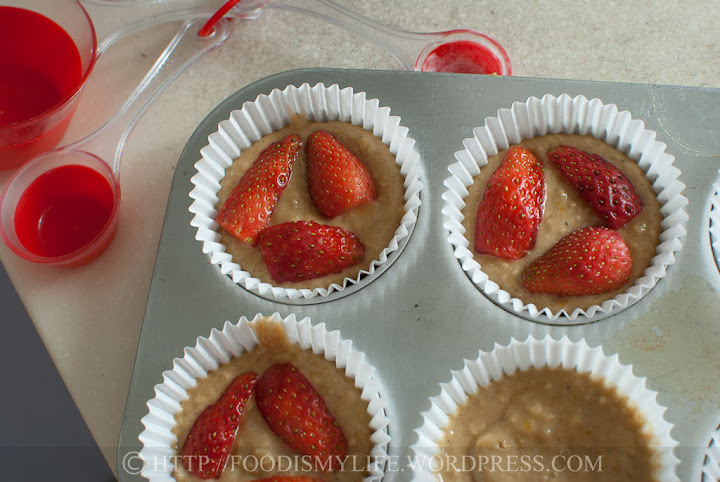 The cupcakes look amazing…perfect for breakfast and I love the combo of brown sugar and strawberries. Thank you! Love your maple raisin ice cream, looks so sinfully delicious! Thank you! I tried baking one without any addition of fruits and the cake actually rose very well! Wow these are amazing! Love the way you played around the recipe and managed to create your own splendid version. Gorgeous! 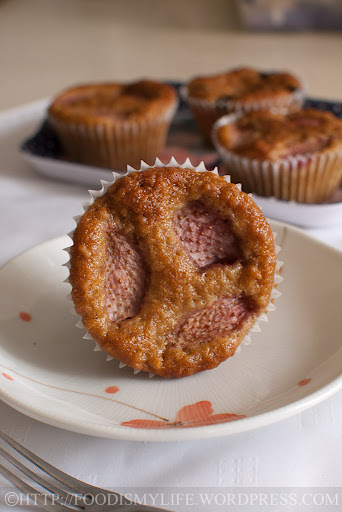 I haven’t made strawberry muffins before, but these look and sound amazing. Thank you! It’s my current favourite breakfast food and snack! it’s nice seeing you tweaked the recipe a little by adding some oats into it and also with olive oil. i cant remember whether have i used olive oil in cakes before but vegetable oil, yes. Does that cake taste a hint of olive oil? have you made the cheese swirled cake? i halved the recipe and the size was good enough. Congratulations! You sure got a winner, looks good, taste delicious and best of all healthy. I would keep the chocolate though, but dark instead of white.. These look like an amazing way to have breakfast! Love the brown sugar inclusion. Aww thanks! (: have a great week ahead! Thank you Angeline (: Adding oatmeals make me feel that the cake is healthier… which makes me unable to stop at just one! Thank you! I need to make another batch soon, they are gone too fast! Well as a breakfast food, if I were offered cereal/oats or your cakes, I definitely know which one I’d be going for! 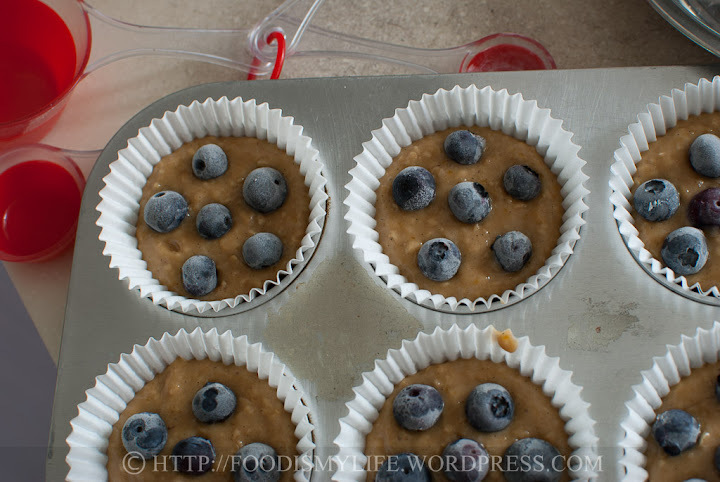 Both blueberry and strawberry versions look delicious and absolutely decadent!! A great snack to have at any time! Thank you, I’m glad they turned out ok after all the substitutions! Thank you! I’m not a huge fan of white chocolate… but I might actually add in some milk or dark chocolate chips in the future for a more sinful cake hehe. Yes creme brulee sounds a bit scary! But I’m also excited at the same time to try them! 🙂 All the best in your creme brulee making! Thank you! When the cupcakes are fresh from the oven, the blueberries actually burst inside our mouths when we ate them… it was really good! Thank you! I think it could use more oats in the future! Your version is indeed more healthy minus the chocolates…I am having butterflies thinking of making creme brulee! I have not done that before either! These look gorgeous and super moist! I love the blueberry look the best. These sound so incredibly wholesome!!! I like your healthier version of this fresh strawberry cake. The addition of oats is a great idea! Your “re-make” is very creative and looks really good! And a good idea too to bake these into cupcakes. Both the strawberries and blueberries looks wonderful! A lovely bake! Thank you for baking-along with us! Have a nice week!